early drop. It’s one of those things that makes freestyle look easy while beginners are lost as to why they can’t replicate the big moves. Here’s why you should always face the wind when you have the disc. First is the concept of a wind shadow. Predictability is one of the most important aspects to completing a trick. One must time the flight of the disc. If the wind is changing under the disc, the flight will be unpredictable. A wind shadow is what happens when something, or someone blocks the wind from the disc. When this happens, the disc falls quickly to the ground. It’s nearly impossible to recover from a wind shadow. Now imagine your back is to the wind. You set the disc high into the air. It floats nicely down as you prepare for a trick catch. But wait, your body will create a wind shadow. As soon as the disc is in front of you, you are blocking the wind and the disc will fall faster, which will break your timing. Point 3 as we competitor’s like to joke…that’s a drop. If you are facing the wind, you will never wind shadow yourself. Now just get your partner to move out of the way and you are ready. The second reason to face the wind may be even more important. 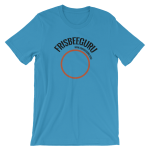 Part of what makes freestyle frisbee tricks work is the horizontal flight of the disc. That is, it doesn’t just go up and down, it goes side to side. This is what allows it to travel under your leg or pass behind your back for the restricted trick. Without horizontal flight, many restrictions will involve you moving over or around the disc. With horizontal flight you can hold a pose and let the disc do the work as it passes through the restriction. OK, so if you are doing solo tricks, how do you get that horizontal flight? Well, if you are facing the wind, you can set the disc out, and the wind will blow it back. That’s right, tricks that are seemingly up and down, very often have some form of an out and back aspect. Even many passes are done this way. Like the roll across set. So what if there is no wind? Well then you make your own wind by running in a specific direction. Your movement through the air causes a relative wind for the disc. This is why you see players chasing after the disc while on an air brushing run. With face the wind always in mind I eventually developed a new sense. That is, where is the wind coming from. I feel is on my skin and I watch for clues and somehow I always have a sense for where the wind is coming from. Even when jamming indoors. There’s no wind, but I still have an idea of where the wind is. Or more accurately for which direction we are playing. I watch for clues from the other players in the jam. I see which way they are going to create wind and I go the same direction. When we run to close to the wall, we reset and go back the other way. If you are new to freestyle frisbee then here an experiment for you. Go out to the field with a slick disc. Face the wind and try a simple set to a catch. Then put your back to the wind and try again. You’ll immediately see for yourself what a difference this makes. Then, close your eyes and think, where is the wind. Keep that thought, open your eyes, face the wind and try again. If anyone tries this, please let me know what you learn in the comments below.